PT Danone Waters Indonesia - PT DWI or know as Danone Aqua is a leading multinational company in Indonesia that play in a major market segments namely bottled water industry. Danone Aqua is a producers of most popular brand for bottled water products in Indonesia; Aqua, VIT, and Mizone. Danone Aqua is pioneer in bottled water industry in Indonesia which was established in 1973. Danone Aqua is a member of France multinational giant, Groupe Danone SA (Danone Group). In Indonesia, Danone Group running business in 3 business pillars; water, early life nutrition, and medical nutrition. Danone Indonesia is based in Jakarta and now has 23 production facilities and directly employs nearly 15,000 employees throughout Indonesia. Fresh graduates in any field with min. GPA of 3.00. Able to drive a vehicle and have driving license class A (SIM A). JobsCDC.com now available on android device. Download now on Google Play here. Please be aware of recruitment fraud. The entire stage of this selection process is free of charge. 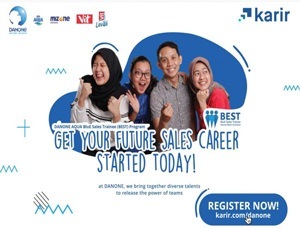 PT Danone Waters Indonesia - Fresh Graduate BEST Trainee Program Danone Group February 2018 will never ask for fees or upfront payments for any purposes during the recruitment process such as transportation and accommodation.